From runways to red carpets .. shiny tights are a big hit this year ... I was so tempted to get my hands on them but unfortunately .. the good quality ones are not easily available . My search ended with my latest discovery of an online shopping store UPTOWN who is offering high quality and trendy fashion wears at such reasonable prices. Uptown is an online ladies wear store which is Islamabad, Pakistan based. Uptown is an online street brand for girls having a variety of clothing products. maxi, gowns and fancy Pakistani designs are also made on orders. 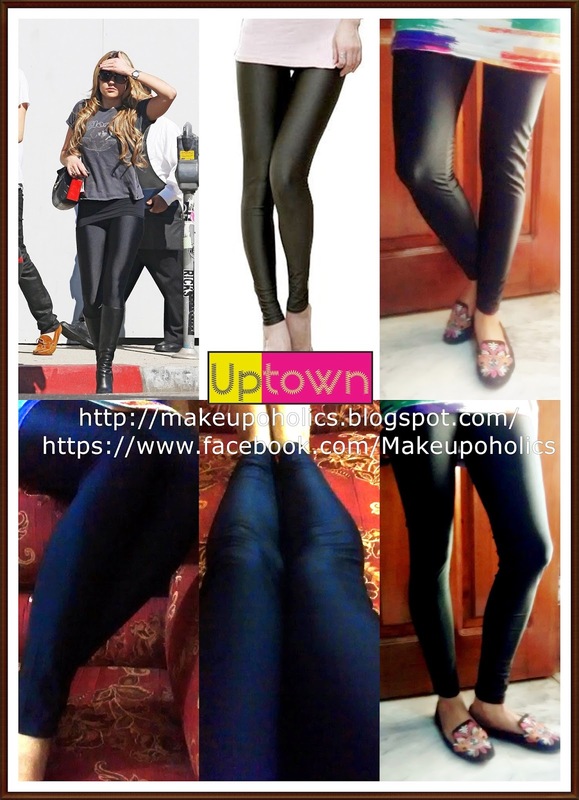 Shiny Tights/ Fluorescent Tights in "Black"
Shiny Tights/ Fluorescent Tights in "Off White"
I was a huge fan of Khaadi tights but not after these .These Shiny Tights/ Fluorescent Tights from Uptown are far better in quality and look . When i first received my package , i was not so sure about the fitting and length of these tights . But once you wear them , they are gonna look so classy and elegant . The material is stretchable that just fits perfectly according to the measures of your body but at the same time its not uncomfortable or itchy . Even you can easily carry these during summer season . They are shiny but in a classy way . The ones you can spot on red carpets and ramps. I was really looking for this material as the ones available in the local markets are no way near the quality of these tights . Also these are super affordable . Would I recommend these ? Definitely Yes . Believe me if your a big fan of Khaadi tights and are willing to pay around 1500 around for those , these are much better in quality , looks and price . These just cost you around 500 PKR which is quite affordable for everyone. For more variety and details , check UPTOWN facebook page.They provide COD services as well and there customer services are super fast and friendly . These are cute specially Black one is so nice. Great that these are comfortable too. aww thanks a lot dear .. n why not ? I searched all over for such tights!